When you enter the land that the LORD will give you as he promised, observe this ceremony. And when your children ask you, 'What does this ceremony mean to you?' then tell them, 'It is the Passover sacrifice to the LORD, who passed over the houses of the Israelites in Egypt and spared our homes when he struck down the Egyptians'" (Exodus 12:25-27). Based on this passage, Jews included questions in their Passover meals, and they continue that practice today. The youngest child present is expected to ask about the significance of what they are doing. 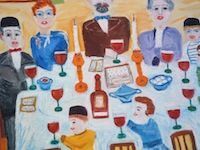 Passover uses the curiosity of children to teach everyone present the meaning of their actions. I wonder if we wouldn't do well to build such questions into our traditions. As materialism invades holidays like Thanksgiving and Christmas, we can raise a line of defense through a simple question: "What does this holiday mean to you?" When routine and ritual threaten to trivialize our times of worship, we can protect our children by encouraging them to ask, "What does this service mean to you?" These questions don't have to be asked by children, of course. We can ask them. As we participate in traditional activities, be they civic traditions or religious ones, we do well to stop and ask ourselves, "What does this mean to me?" What does this mean? It's a simple question that can lead us to not-so-simple answers. We do well to stop and ask ourselves, "What does this mean to me?" "What Does This Mean?" by Tim Archer is licensed under a Creative Commons License. Heartlight encourages you to share this material with others in church bulletins, personal emails, and other non-commercial uses. Please see our Usage Guidelines for more information.